So, while I'm convalescing with my head cold and waiting to feel better so I can start plastering the fireplace, I'm still chipping away at my dining room buffet project. You may wonder why we move so slowly on projects. Of course we have the usual reasons: budget, time, et cetera. But the other reason, which I suspect is common, is fear. 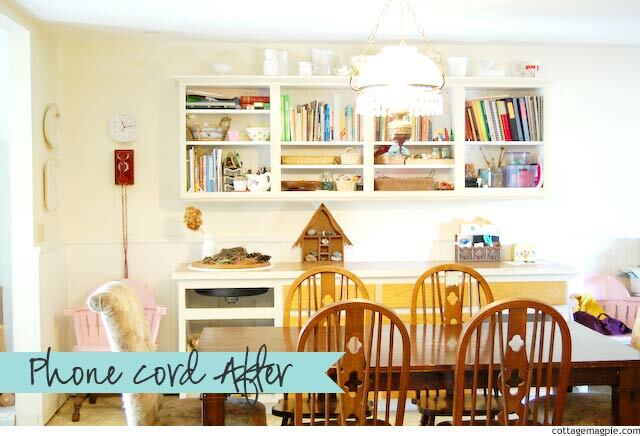 A little thing like moving a phone cord can easily become a much larger project. You open a wall, you have no idea what you're getting into. I speak from experience (*cough* leaky faucet -> whole house rewiring project *cough*). One or two of those, and you get a little DIY PTSD. 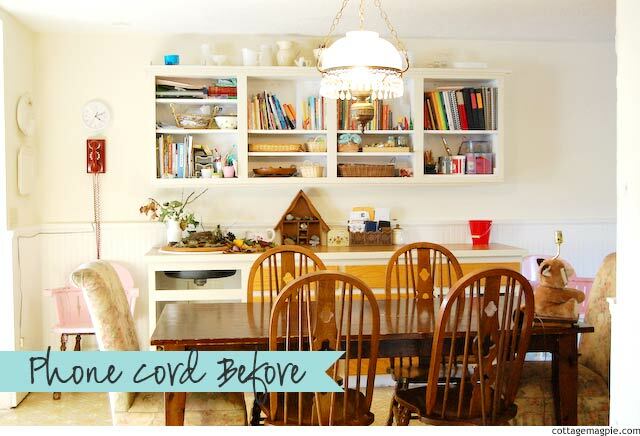 Case in point, the phone cord in the dining room. 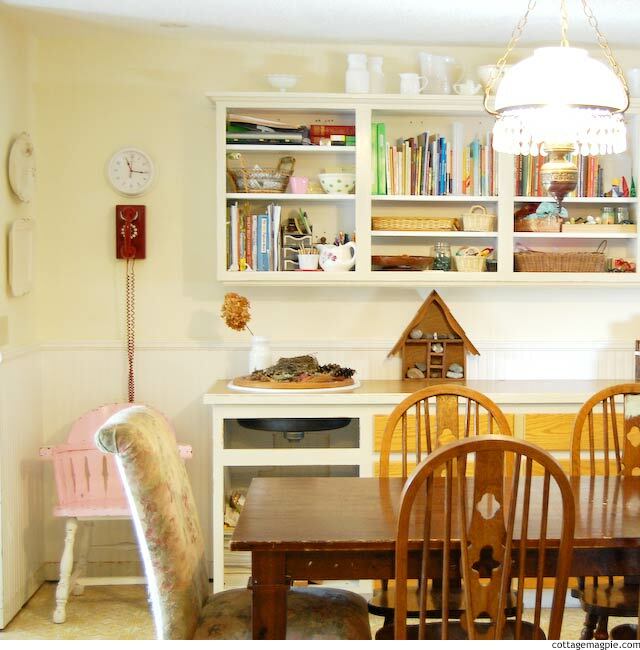 You probably didn't notice, but the other day when I showed the dining room, you could see the phone cord stapled to the wainscoting and up to the phone. After some deliberation about options, Mr. Magpie decided to work from the other side of the wall (no wainscoting). We got lucky and the phone cord came down from the attic, so we didn't even have to splice it, just reroute it to where we needed it. Amazingly, he did that in about an hour and a half, then patched the wall back up and everything when he was done! That's what I call extra bonus service. Often we don't have time to patch the hole, too, and then the hole sticks around for ages, too. The hardest part of the whole thing was getting a short little phone cord to plug the phone into the wall socket. Nobody carries them anymore! People didn't even know what we were asking for. One person asked if we really meant USB cable. A friend finally gave us one out of their cable stash. I guess we're really going old school here! And it looks even better if I put my one finished chair (with white legs instead of the unpainted brown), doesn't it? I really need to do the legs on the last three chairs. 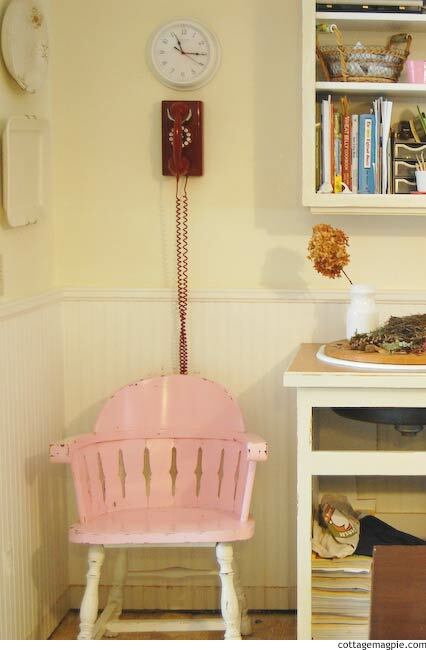 So now I have my little red phone, and my little pink chair, and we're all set for long chats with friends. And yes, we have a land line. I know that's kind of weird in today's world. For years I didn't bother, I just had my cell. But I'm notorious for leaving my cell phone at the other end of the house, and my parents needed us to be able to respond immediately. So we got a land line. And you know what? I'm so glad I did. There's something sort of cozy about knowing that someday my kids might be able to call me, no matter where they are or what they're doing, and this red phone would ring and I would answer. And I would sit in the pink chair and hear about their lives. Not too soon, of course. 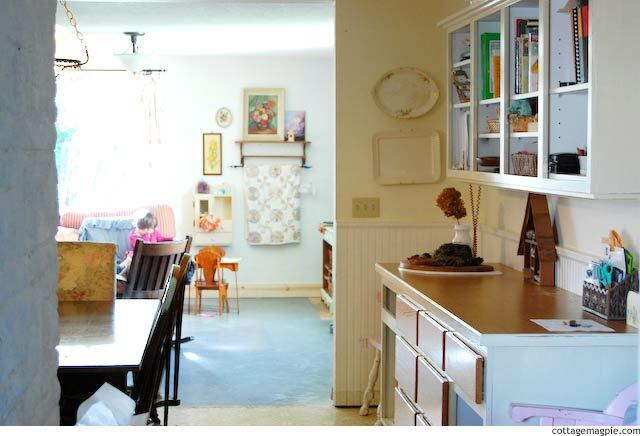 As for my dining room, how that the cord is installed and the buffet cabinets have been polyed, I can work on the doors and drawers now, but more importantly I can start plastering the walls. Between this wall and the fireplace, I guess I have a lot of plastering in my future! :-) Good thing I enjoy it. What about you? Do you get nervous about aspects of a project and get stalled? How do you overcome it?